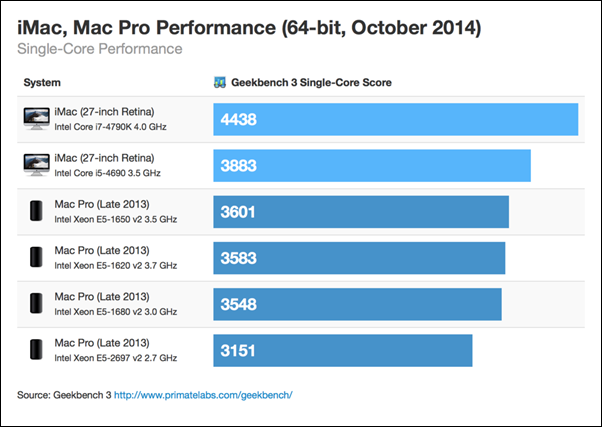 Apple’s new iMac with Retina 5K display is more than just a pretty screen, and after recent Geekbench speed runs showed that the new Mac is faster than the older model that it now sits above in Apple’s product lineup, the next machine in its sights was always going to be the Mac Pro. Launched at the end of last year, the new Mac Pro is not only a thing of beauty but also an extremely capable machine, especially when used with applications that take full advantage of multithreading. 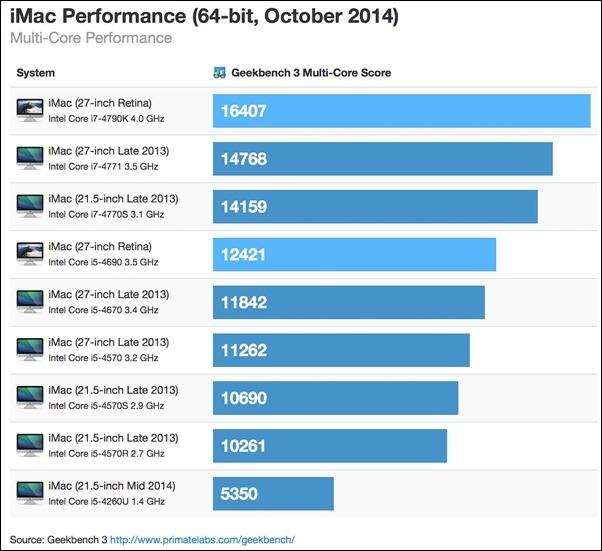 All those extra CPU cores need to be used to their fullest in order to take advantage of what the Mac Pro can offer. 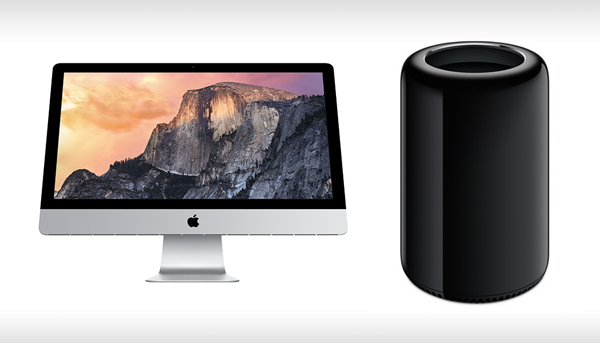 Which had people wondering how the new, high-end iMacs would fare against, say, the lowest end Mac Pro in the lineup. The answer, just as had been predicted by some, was that the 27-inch iMac with Retina 5K display is actually faster than the base model Mac Pro for single threaded tasks. That means that anything normal people would do, the top of the line iMac is better at than the cheapest Mac Pro you can buy. That’s quite the statement. 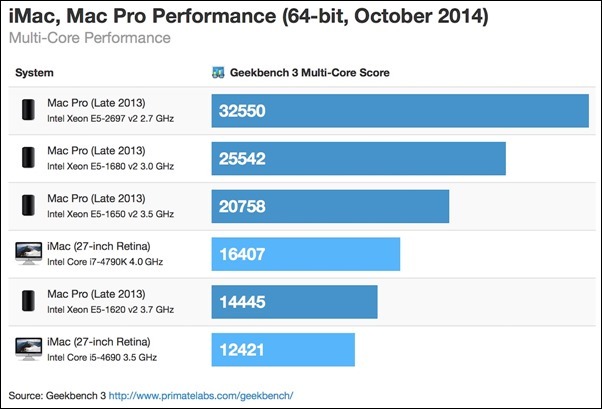 But it’s even faster than the Mac Pro in multithreaded applications, too, when you choose the 4.0GHz option. In fact, it’s around 13% faster according to tests done by Primate Labs, the same people that have been testing the lesser Retina iMacs. Of course, as soon as you start bumping up the Mac Pro’s specs, then the new iMac starts to fall behind a tad, but considering the amount of money that needs to be dropped to work your way up that Mac Pro line, that’s rather to be expected. The simple fact of the matter is that if you’re going to be playing towards the lower-end of the Mac Pro lineup then the the all-in-one is the way to go, even if you’re after specific performance gains from using multithreaded apps. And it even comes with a 5K screen free! No, it does not. At least not if you buy it from Apple.